The pectoralis minor is located under the pectoralis major, and both form the anterior wall of the axilla. The shortened , tight muscle can be easily palpated there. It is also located close in relation to the brachial plexus and both the subclavian artery and vein, which all run between the muscle and the rib cage. Pectorlis minor and coracoid process together form a bridge under which nerves and vessels go to he upper limb . Pectoralis minor is a triangular in shape it`s base arises is formed by fleshy slips arise from the anterior of third to fifth ribs near their costal cartilages variations in the origin of the muscle is common. The apex of the triangle is inserted into the medial border and upper surface of coracoid process of the scapula. The blood vessel that supplies the pectoralis minor muscle with blood is the thoracoacromial artery, which is a short artery that branches off the larger axillary artery of the chest and upper extremities. The primary actions of this muscle include the stabilization, depression, abduction or protraction, internal rotation and downward rotation of the scapula. It elevates the ribs for deep inspiration when the pectoral girdle is fixed or elevated. Both pectoralis muscles work with the serratus anterior muscles to create a full range of movement for the scapula. As mentioned by vladmir janda`s, Pectoralis minor is one of tonic muscles that tends to be overactive, prone to be tight in our body. In Neurokinetic therapy (NKT), pctoralis mnor is considered The king of compensation, as it tends to be overactive for an inhibited or under active Serratus anterior, it's easily to be shortened and tight because of many factors, including rounded shoulder posture, glenohumeral joint dysfunction,breathing dysfunction, and a variety of compensation. With the cords of brachial plexus and the axillary blood vessels lying between the coracoid process and the rib cage, shortening of pectoralis minor may produce impingement on these large vessels and nerves, causing shoulder impingement and thoracic outlet syndrome. Serratus Punch exercise : it`s highly selective to serratus anterior. he Modified Push-Up Plus exercises, both in floor and wall version, with only focusing on the concentric phase of he exercise. Trigger points in pectoralis minor have almost identical referred pain patterns as in pectoralis major muscle.These pain patterns start in the front of shoulder and can extend down the inside of the arm, elbow, forearm, palm of the hand, and into the pinky, ring, and middle fingers. A tense pectoralis minor muscle can also entrap nerves in the armpit region that cause pain, numbness, and tingling to travel down the arm and into the hand. Position: Patient is supine with the arms at the sides, elbows extended, palms upward, knees bent and lower back flat on the table. Test: The examiner stands at the head of the table and observes the position of the shoulder girdle. The amount of tightness is measured by the extent to which the shoulder is raised from the table and by the amount of resistance to downward pressure on the shoulder. Tightness may be recorded as slight, moderate, or marked. ↑ 1.0 1.1 1.2 1.3 kenhub.Pectoralis minor muscle. Available from:https://www.kenhub.com/en/library/anatomy/pectoralis-minor-muscle (accessed 20 July 2018). ↑ Study.com. 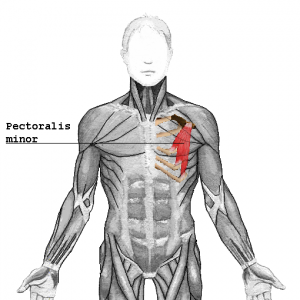 Pectoralis Minor: Function, Blood Supply & Innervation. Avilable from:https://study.com/academy/lesson/pectoralis-minor-function-blood-supply-innervation.html (accessed 20 July 2018). ↑ 4.0 4.1 4.2 4.3 Kendall F, McCreary E, Provance P,Rodgers M,Romani W. Muscles:Testing and function with posture and pain. 5th ed. Philadelphia: Lippincott Williams & Wilkins, 2005. ↑ health line. Pectoralis minor. Available from: https://www.healthline.com/human-body-maps/pectoralis-minor#1 \(accessed 20 July). ↑ Castelein, B., Cagnie, B., Parlevliet, T., Cools, A. Serratus anterior or pectoralis minor: Which muscle has the upper hand during protraction exercises?. Manual Therapy,April 2016: 22, 158–164. ↑ trigger point therapist. Pectoralis minor. Available from:http://www.triggerpointtherapist.com/?s=pectoralis+minor (accessed 19 July 2018).